Presque Isle Printing owner Alice DeGeorge is hardly alone in representing Erieu2019s printing businesses, but has managed to stand out through her attention to detail and by thoughtfully applying the feedback of others. Although air transportation is one of the safest means of travel, 1 in 3 Americans are afraid of flying. Admittedly, I'm one of them. I still do it, but not without some semblance of anxiety in tow (and a glass of wine before I board). I point this out because this type of situation is governed by irrational fear — just like the fear of your next big idea "being stolen." The reality is that both of these situations are very rare. Every day you can find individuals working on their "next big thing," and every day that person hears something along the lines of "don't tell too many people about it, or someone might take it." The fear of someone stealing it and doing it first has now taken up room in your head. However, there are two main reasons why this likely won't happen. First, your idea really isn't all that important. It's the execution that matters. The truth is that few ideas are exclusive: Google was not the first search engine — they just out-executed the competition. Second, people are busy. Even if someone loves your idea, the chances of them putting in the time and energy to see it through are pretty close to nil. Recently, I had a conversation with Alice DeGeorge, owner of Presque Isle Printing Services and host of "Keeping It Local; Keeping Erie Awesome" on Jet Radio 1400 AM and 96.7 FM. I asked her about her thoughts on this issue; first asking her a little more about her background. "Originally, I went to school for website design and management with a minor in graphic design," Alice tells me on the phone. 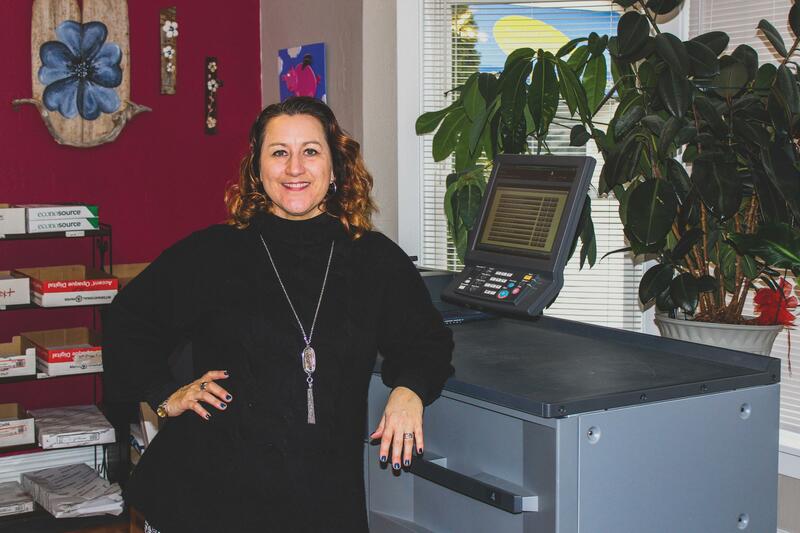 "After school, I worked for a few print companies before I started my own." The path that led Alice to start her own business was as circuitous as most entrepreneurs'. "After my paychecks bounced three times with the first print company I worked for, I decided to move on." She got another print job until that business was sold to another company. "After that, I decided I didn't want to work for anyone anymore." She had six weeks to figure it all out. "The day I left my job, I opened the doors to my business — and this December will be our tenth anniversary." But it wasn't easy. "I had no idea what I was doing. I blindly started the process of starting a business — but I got great reception and help along the way. I had developed so many relationships over the years in the print industry, but many of the customers were through email and phone calls. I put all of my extra funds into advertising. Most of the past customers I worked with didn't know my face — but they knew my name." She eventually got her customers back. As the print industry is very competitive, I asked Alice her thoughts on the fear of others stealing someone's big idea. "While I know it happens, it's rare. Most of your idea comes down to effort. There's a certain understanding of why entrepreneurs want to keep things close, but you need to ask for advice in order to help fine-tune your efforts. There might be people that want your idea, but how far are they actually going to take it?" She fully understands the fear, however. "But by keeping your ideas close to the vest, you miss out on constructive feedback, and the opportunity to let others help you progress." And she adds, "Don't be afraid to fail. Without failure, you won't learn. All experiences — good or bad — are worth going through." She emphasizes that we need to be more humble. "The old adage, what doesn't kill you makes you stronger, really holds true. The universe will keep giving you more experiences that will continue to give you strength." There is a phrase: "ideas are cheap. It's the execution that matters." If you can't deliver the right product or service to the customer in a way that differentiates yourself from your competitors—then your business won't be around long anyhow. Be exclusive in your conversations, but trust the process. By thinking you cannot share your idea with anyone—you give it no room to grow — let alone persist. Talking to others — especially those in the arena — are tools for education. At the end of our conversation, Alice tells me, "If you are focusing on what people might be doing behind you, you're never going to be able to move forward."